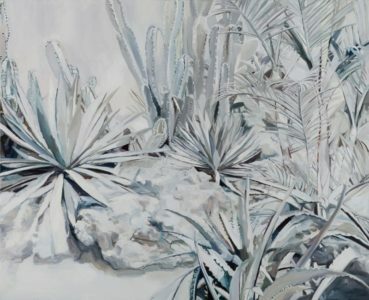 Tropical sceneries finely coated by a delicate layer of dewy snow; glass cabinets housing an array of anthropological items; the blurred vision of a seated mother and child; each are running explorations in Wang Zhibo’s (b. 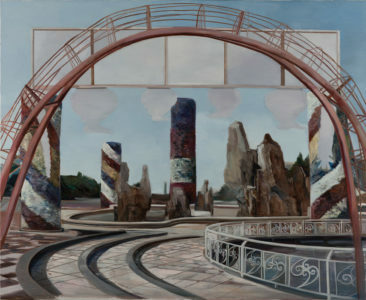 1981, China) practice that surveys the absurd spectrum of what is real – geographically, historically, ethnographically, architecturally. 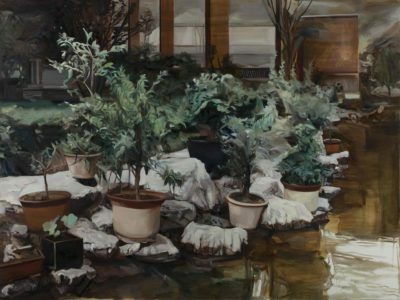 A graduate from the China Academy of Art Oil Painting Department, Wang creates oil on canvas paintings that confound our notions of time and space. 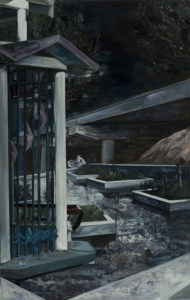 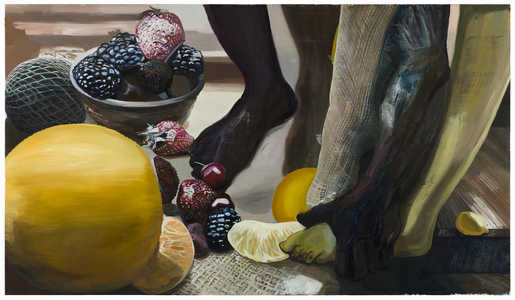 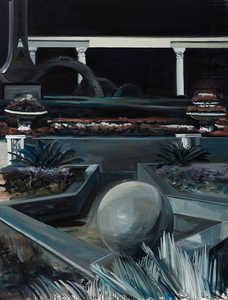 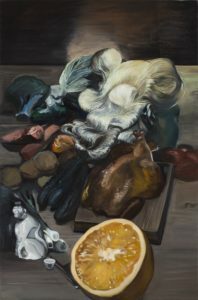 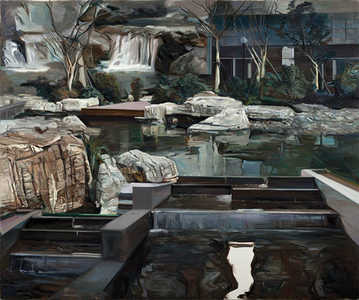 Transcending traditionalism through the subject matter depicted, which is both curious and challenging, Wang channels her painting to represent the variances of our visual experiences, similar to the reflection on the surface of water: capable of capturing the multiple manifolds of a subject. 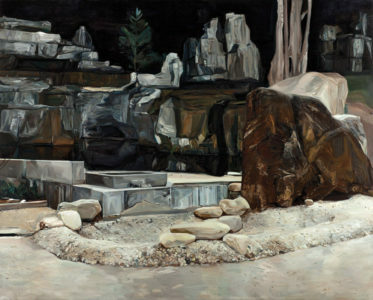 Whilst always retaining a focus on our concepts of the real, Wang’s work has seen a sequence of periodic evolution. 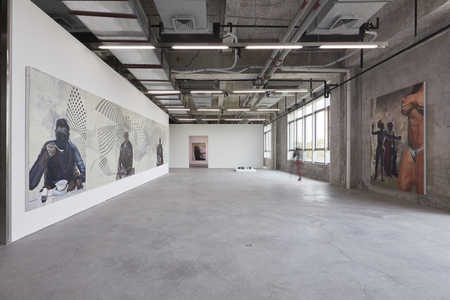 Wang’s ‘Standing Wave’ series from 2012, for example, exemplifies a particular interest in architecture and draws viewers into distinctly enigmatic and isolated spaces. 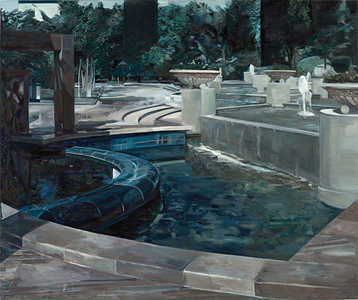 Seemingly realistic yet illusory, Wang depicts settings that combine natural elements such as running water, a towering tree or a rock, with man-made constructions ranging from a cemented path to an ornate fountain. 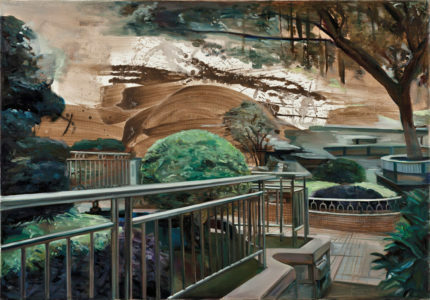 Purposely non geographically-specific, Wang’s paintings could be reflecting a hotel in Hangzhou or a rural outlet in the US; an aura of displacement that lends each work an eery and engaging force. 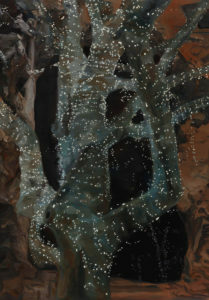 Moreover, whilst the viewer senses the presence and tracks of man, he is pointedly nowhere to be found. 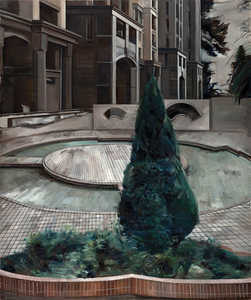 The viewer is thus confounded as to the status of the space: abandoned, imagined, transplanted or discovered. 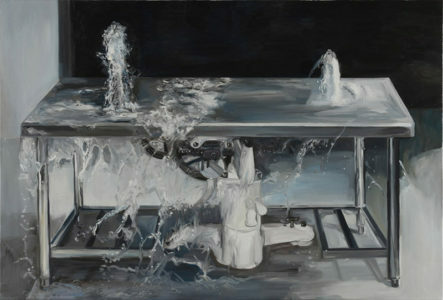 This running ambiguity regards time and space laced with isolation permeates Wang’s further series’. 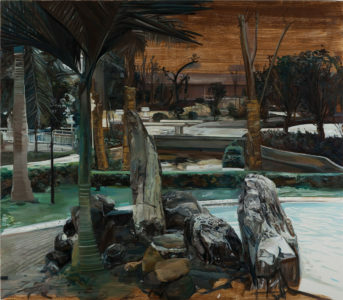 ‘Tristes Tropiques’, for example, which focuses on leafy tropical landscapes, absurdly presents each setting coated by a fine layer of misty snow. 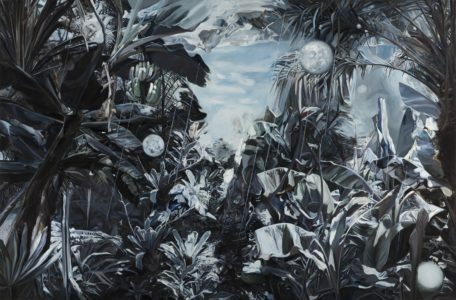 Probing our geographical understanding, the works equally allude to shifting climates, and the impending possibility of the previously implausible. 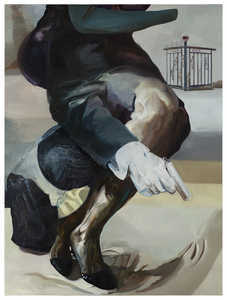 Devoid of human presence, our personal culpability is hinted at without being explicitly spelt out. 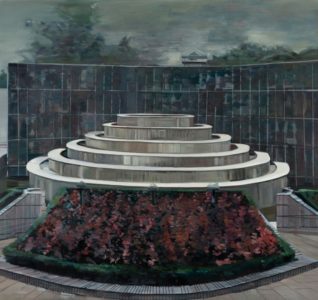 ‘Time Traveler’ (2015) furthermore testifies to visual transportation, whether into the future or the past, or even seemingly across dimensions. 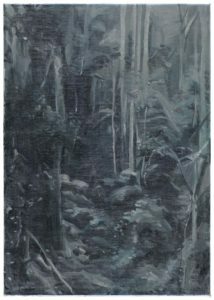 Dewy and nearly spectacular, the painterly finish hints to illusions, a magical environs, a sentiment that is heightened by the rising mist. 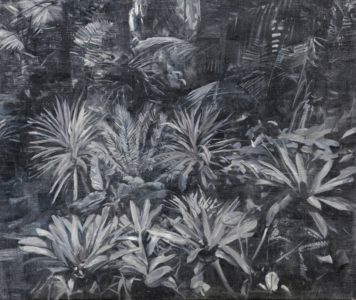 Several of Wang’s works, however, seem to contrarily hint at human presence; upon closer inspection though, one notes that each painting is crucially devoid of humanity or expression. 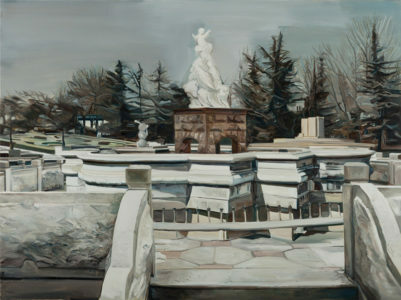 ‘Mother and Son’ (2015), for example, presents a classically religious composition. 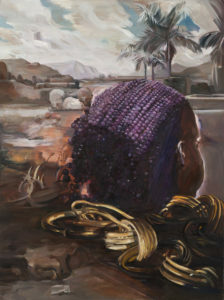 Yet, the setting is distinctly tribal with various skulls scattered upon the floor and both figures being adorned by bead-like wooden jewellry. 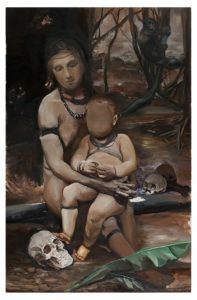 More importantly, whilst the mother’s face is delineated, the child’s is unnervingly blurred to the extent of resembling defacement. 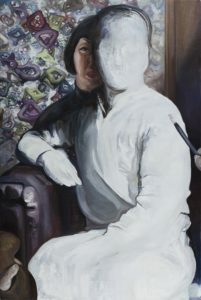 Such vigorous anonymity heightens our consciousness of how much is read through facial features, expressions, the very characteristics that distinguish each and every one of us. 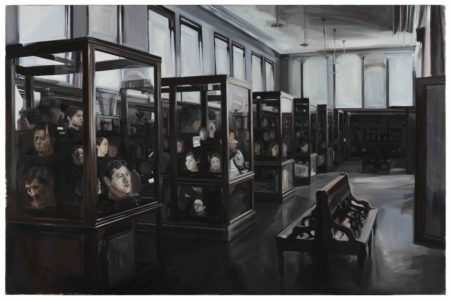 This recognition is heightened by Wang’s recent series ‘The Archives’, which depicts, from a focused as well as wide-angle view, museum glass cabinets housing an array of anthropological heads. 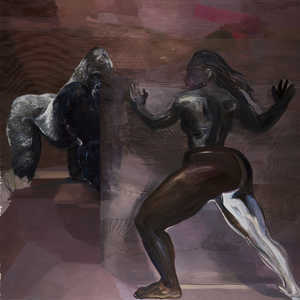 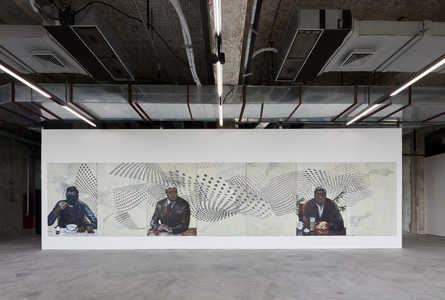 Emphasising her reflection in a 2013 interview, “I think I am correct in saying that one of my working methods is similar to that of an anthropologist”, the works were inspired by visiting many museums during her travels across the US, Europe and China. 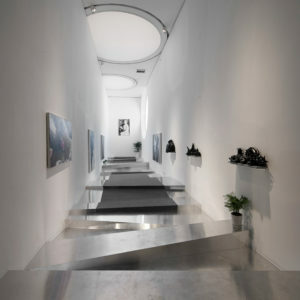 A reflection on our understanding, and how much is defined by our interaction with humans, the works simultaneously challenge our understanding of the ‘museum’ as a place of storage and exhibition, extending it to a zone of interaction and mutual observation. 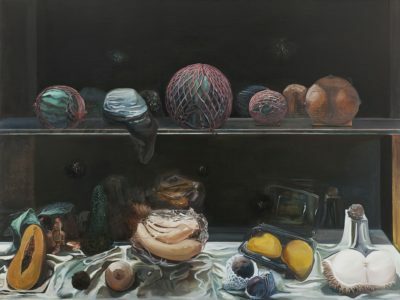 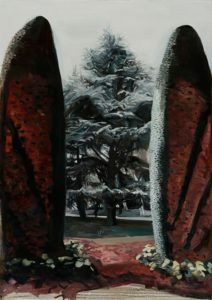 Developing upon this concept of observation and display are her series of still life paintings, such as ‘Hocus Pocus’ (2015) and ‘Mead’s Dilemma’ (2015), which present an array of flora, individually positioned on vertical stands. 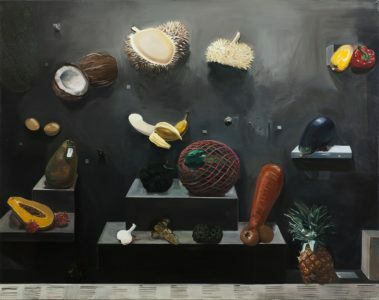 Again challenging our notions of geography as well as perception, one finds an enlarged chestnut adjacent to an equally-sized banana, or plastic-wrapped fig next to a heavily protected cabbage. 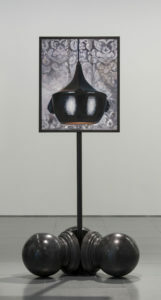 Recognisable items, their placement and display takes on a bodily association: hanging, balancing, piled, positioned. 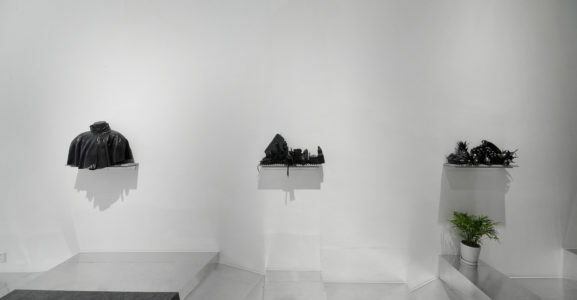 Ultimately, these works summarise the cornerstones of Wang’s practice, which achieves, through the subtle consideration and rendition of the ordinary, to flesh out the limits of our understanding and extend, through time and space, our conceptual and visual boundaries. 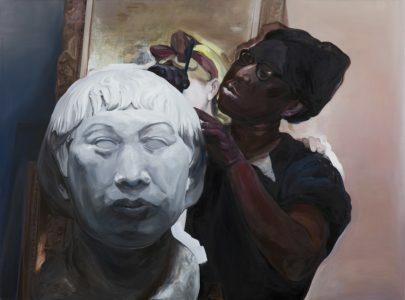 Wang Zhibo is a highly regarded female Chinese painter who rose to prominence after being awarded the prestigious national Luo Zhongli Scholarship in 2008. 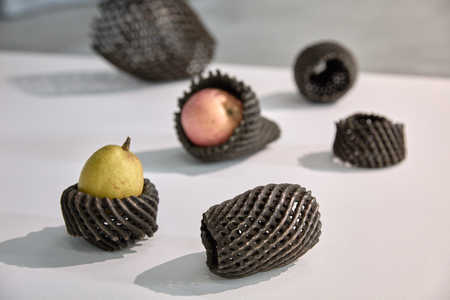 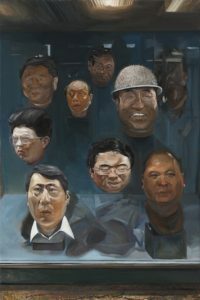 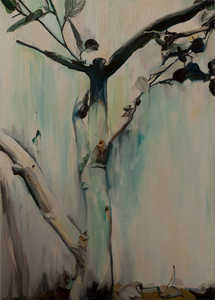 Wang’s work has since been exhibited from Hong Kong to New York, including exhibitions at the Penrith Regional Gallery, Sydney; Chongqing Art Museum, Chongqing; Today Art Museum, Beijing; Museum of Contemporary Art, Taipei. 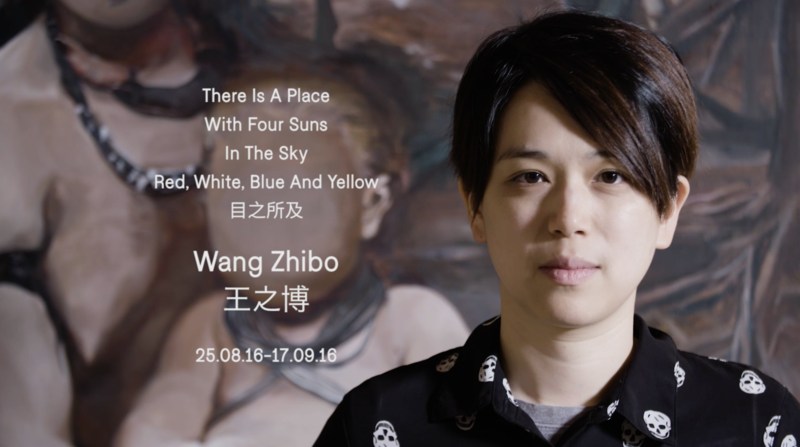 Wang was selected as one of the top female Chinese artists to observe and featured by writer Luise Guest for her book on female Chinese artists ‘Half the Sky’ published in 2016.